On July 22, 2012, exactEarth launched the latest satellite into the exactView constellation. exactView- 1 (EV-1) is the highest detection Automatic Identification System (AIS) satellite ever built and is the fifth satellite in the advanced vessel monitoring satellite constellation from exactEarth. Because of this constellation, many in the industry regard exactEarth as pioneers of space-based AIS services as the Company has increased the visibility range as well as enabled the monitoring of vessels throughout the worlds oceans and remote waterways. Lisa Scalpone is Vice President Sales, Marketing, and Business Development for Services at ViaSat Inc., and also is responsible for government affairs. She joined WildBlue Communications when it was a start-up company in 2000 and helped develop the organization to its status as a broadband Internet service provider with over 450,000 customers across the U.S. In 2009 WildBlue was acquired by ViaSat, which launched a new high-speed satellite broadband service called ExedeSM Internet in January 2012. With the winners of the University Nanosat Program-7 to be announced shortly and the commencement of the Nanosat-8 program expected in the coming months, it is appropriate to look back at this program. Chris heads up the sales organization for the European market of Hughes Network Systems, LLC., a subsidiary of EchoStar Corporation. His responsibility is to drive growth within existing and emerging European markets. Market share in the FSS segment can be measured in any number of ways including total revenues or fleet size. 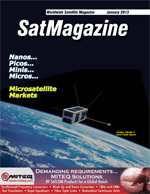 One additional metric, used in NSRs Global Assessment of Satellite Supply & Demand 9th Edition study, is market share based on total leased commercial capacity either in terms of C-, Ku- and widebeam Ka-band transponders for the classic FSS segment or by Gbps of capacity in the emerging High Throughput Satellite (HTS) segment. Satellite communications have come a long way since Russian theorist Konstantin Tsiolkovsky first conceived of the geostationary orbit in the early 1900s, and the launch into space of the first commercial satellite, Intelsat 1, in 1965. Research consultancy Futuresource expects a number of broadcasters to launch 4K channels during 2014. This appears to be the next iteration in the broadcast and media industry and equates to resolutions of approximately 4,000 pixels wide by around 2,000 pixels in height. Jim Armor has been Vice President of Strategy & Business Development for Spacecraft Systems and Engineering Services of ATK Space Systems, Inc. at Alliant Techsystems Inc. since April 2009. Major General Armor [U.S.A.F., ret.] was the Founder and Owner of The Armor Group, LLC, and served as its Chief Executive Officer since September 2007. He served as an active duty officer in the United States Air Force from May 1973 to January 1, 2008. As a Major General, he served as a Director, National Security Space Office, Office of the Under Secretary of the Air Force until retiring in January 1, 2008. PIONEERING: Sustaining U.S. Leadership In Space, NASA is an exceptional institution in a tremendous predicament. On December 4th, the Space Foundation released PIONEERING: Sustaining U.S. Leadership in Space, which puts forth recommendations to strengthen both NASAs focus, oversight and funding and the overall U.S. civil space program.